One of the things you hear marathon runners talk about is “the wall”. This is the moment around mile 20 or so when many people reach that critical point where a physical and mental choice is made. The choice revolves around continuing to run, walking, or for some just plain quitting. 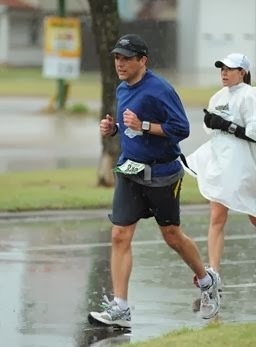 I can remember hitting this moment during my fist marathon several years ago. It was somewhere around mile 22 and after three and a half hours of running. It seemed most of the people around me at this point were walking or doing a little run/walk combo. To say we were running at this point was a bit of stretch. Oh how I longed for the pain end and to join the comfort of those who were walking. One cool thing at the Dallas White Rock Marathon is that if you are a first time marathoner you have a different number you wear so that anyone will know you are a first timer. Here back at the end of the pack there were several of us first timers. For many people the labels we wear in our hearts about who or what we think we really are can be completely debilitating. Many are self-created for no real reason at all while others are the result of false assessments placed on us through the ignorance and meanness of others. I am 46 yet in my head on bad day I can see very clearly the time as a second or third grader when in a moment of self defeat I etched “dummie” on a brick outside the west side of our house. That moment and that word haunted me for years as not only did it continue to echo in my head but later I realized it would not come off the brick. I had created a false label.